Crow is a scrappy, independent thief with a finely polished reputation and plans to retire in luxury—until the wizard Duzayan kidnaps the love of his life. All he has to do to rescue her is make a trip to the middle of nowhere without getting killed by bandits, find an impossible treasure, avoid the treasure’s powerful guardians, and make the return trip through the wild. Lacking confidence in Crow’s commitment to his love, Duzayan ups the ante by slipping Crow a poison meant to ensure his speedy return. Adding insult to injury, the wretched wizard decides to pair Crow up with Tanris, his least favorite person. As it happens, Tanris is the law-keeper who put Crow in this predicament in the first place. Doomed to work together in spite of obvious bad blood, the pair embarks on a rollicking, snarky ride through a land of wizards, demons, and ghosts. Luckily, Crow is armed with a razor-sharp wit and the love of the gods. They’d need it …. Will what Crow has be enough to pull him through this adventure. Robin Lythgoe, the mind behind these wild travails, has kindly set aside a selection of minutes to guide us through what lies ahead in the pages of ‘As the Crow Flies’. Robin, let’s take a moment to step back to the start, what originally inspired you? Crow’s story began with the image of him perched on a windowsill, looking down at a river directly below while a wintry wind blew around him—and the sound of pursuit came from behind. I could hardly leave him there, now could I? Well, you could, but it wouldn’t have been very nice. Or very exciting. I guess I could see you leaving him there if you didn’t get excited by writing, or became very exhausted by knowing all of the work you’d have to do when he moved from the riverfront. Do you feel that that you lean more towards energy and excitement or exhaustion? Both? When it’s going well, I have all kinds of energy. I could climb literal (pun!) mountains. When I’m slogging through a difficult scene, I just want to crawl under the desk and sleep! *Laughs* Well, I hope that you have some nice comfy pillows down there. If you’re going to catch some z’s it’s at least worth doing it right so you’ll be well rested! When you are well rested and working on a chapter, what are you usually thinking about? I always have the character in mind—with the scene goal dangling ahead. It’s fascinating and challenging all at once to put myself in the place of a character and pretend for a while that I AM that person. It is an escape. It is a challenge. Characters, and working with them can indeed be challenging. Was their initial development also challenging? They all waltzed in when I needed them like they were waiting in the wings, complete with physical descriptions, accents, quirks, talents… There was one exception, and I’m still trying to figure that one out because she’s coming back for the next book. And she’s got secrets she hasn’t even told me! I hope you learn some more of the secrets soon! Would any of those secrets be popping up in your next project perhaps? What can you share about your next release with us today? That sounds like fun! So fun in fact that I’d better let you get back to it! Robin thanks for taking a little time to introduce Crow’s world to myself and the readers and I hope to hear more about him soon! Excited to read the book we discussed today? Find it here on Amazon: ‘As the Crow Flies ( ASIN: B00AM1ZGUQ )‘. 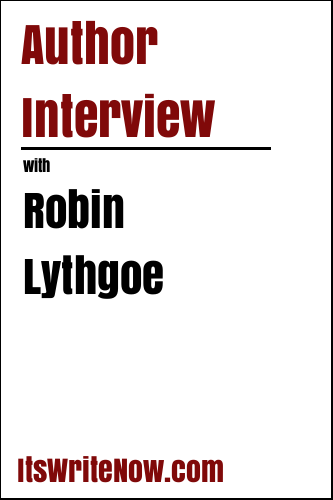 Want to find out more about Robin Lythgoe? Connect here!